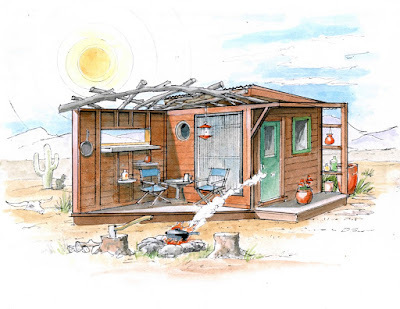 Joshua Tree/29 Palms- DIY-Salvage-Tiny House-Building Workshop in MAY! Hands-on! UPDATE- we just ALSO added a VAN DWELLING conversion project to this workshop!!!! As for California....We loved it so much out there that we bought a 5 acre chunk of land, and we're going back for an intimate, yet awesome workshop! JUST added too- Steven Harrell of Tiny House Listings to talk solar and build with us, and Chris Strathy (from NC- aka "The Capable Carpenter"- a custom tiny house builder). Friday evening will have an on-site salvage competition too for the best item found AND the best repurposing idea. 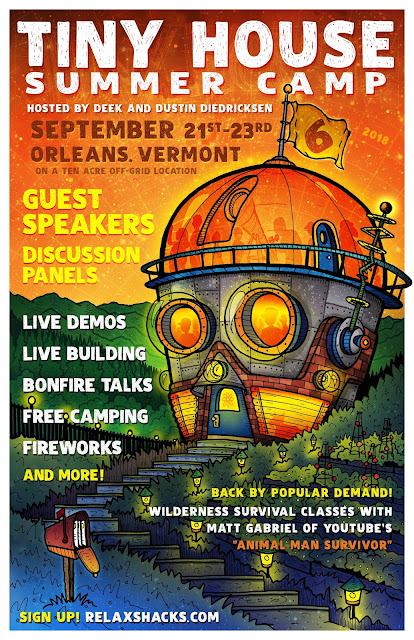 "Deek's Mad-Max-Like Weird Desert Camp Out DIY Thing"
This is yet Another Diedricksen Brothers Workshop (always HANDS-ON building and live demos)- This is their NINTH YEAR hosting workshops in the US and beyond! I'm gonna be blunt here too- if its not fun, we're just not interested, so we want to show you a good time while you also learn a heck of a lot. But you don't know us personally, so you'll just have to take our word on that. This workshop is "out there n' funky"- so maybe its not right for you. Perhaps you'd rather be at home collecting stamps, not taking chances, and being, well, lame. But if you want to hang out with us on a bizarre patch of desert land (5 acres) that we own, while slowly transforming it into something cool, while eating tacos, drinking beer/cocktails by campfire, seeing live demos, asking questions, building things, and so much more- than this is for you. If any of that scared you away- well, we just weeded you out. No love lost/no harm done. The land is rough, its a mess (for now- we'll change that! ), but you're gonna be in great company and learn a lot. Don't worry, its not in the middle of nowhere, and you can drive right up to the site and park on it. This is also going to be one of the smallest and most intimate workshops we do, as we don't want this being a "cattle call" where you won't end up getting individual attention- you WILL. We have a host/teacher for every 4 students. 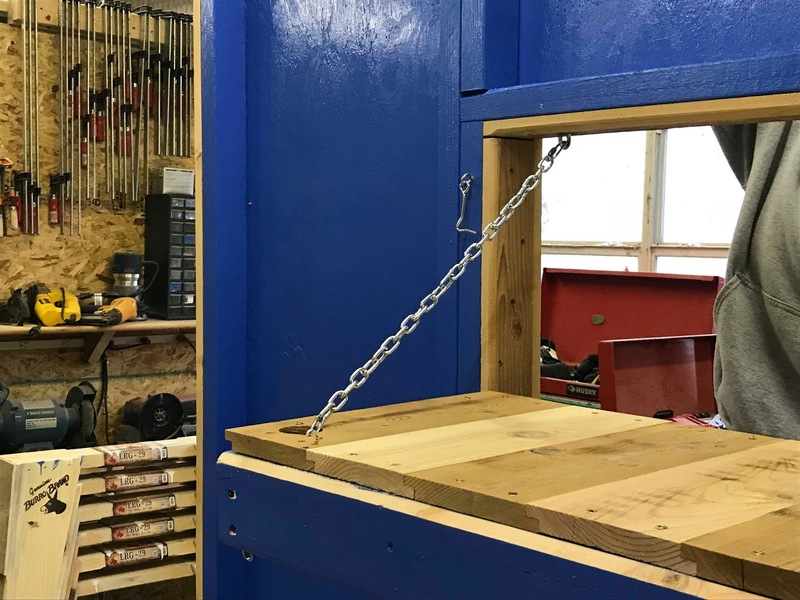 You WILL NOT find that- EVER- with any other workshop! Ideally, we're thinking no more than 12-14 students for this workshop. Any more becomes more a "mob", than an easy-to-manage, fun, group that will get plenty of one on one QnA and build-contact time. This will be two days long- with the invite for you to come an evening early (3rd day) on work-study trade to help us set-up (and even build a little)- A "Tacos, beer, and fire evening" for your help. More on that lower below. -Cost is $299 per person BEFORE APRIL 1st. After April 1st it resumes the regular price of $359.00- so don't snooze! -We DO have camping options (space) if you'd like- nothing glamorous, but its merely offered for those that want to rough it and save some money. There is no running water or power- its a desert site, but VERY accessible and close enough to many stores, restaurants, and more. Each day you need to bring a lunch, and we'll disperse early enough for you to get a late dinner (or you can bring whatever). We're not caterers and people's diets are so varied that trying to feed everyone has been a nightmare in the past. -Its Sat and Sunday- 10am to 9pm each day. You CAN arrive Friday late afternoon too (details to follow) if you'd like, as part of the work-trade hangout (we WILL put you to work clearing/readying the land- but we'll provide the after-work beverages, a ton of tacos, and we can all hang by a fire (you'll need gloves and good work boots). Plan on working about 3-4 hours or so before we break (4pm to 7/8 pm). We'll then all hang out to hit a local pub to hang out together. "Deek, I have no building experience- is this going to be right for me?" YES, we'll have people of all skills levels, but this is more geared to people like you, and people that want to learn some outside-the-box techniques. We have so many cool things we'll be doing and taking about. WHAT WILL WE BE FOCUSING ON THIS TIME? Every workshop is different. 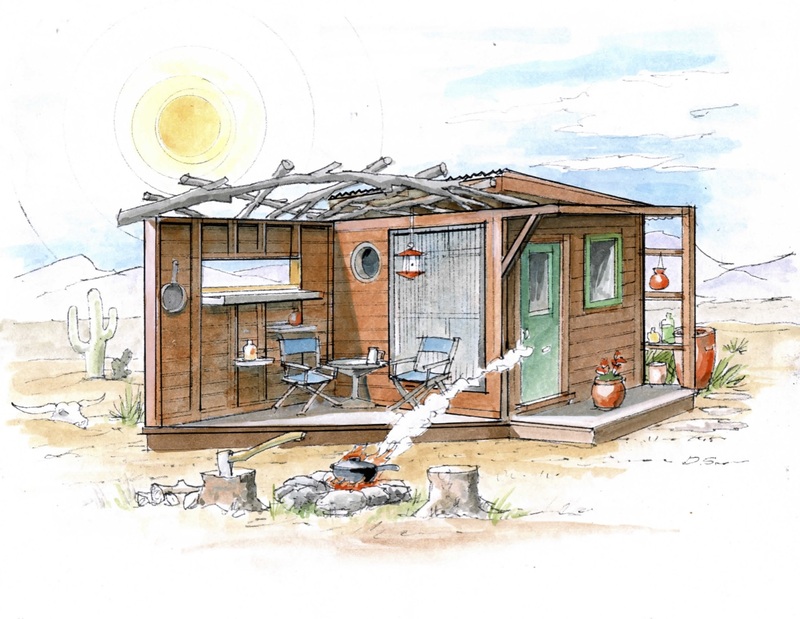 The focus ultimately aims towards cabins, tiny houses, and budget building via small skill projects. While the various things we'll undertake serve as microcosms of many of the things you'll need to know, we'll also dabble with some desert-related approaches, and more. We want you to have FUN, and to learn, and to learn by DOING. What if I need to cancel? Please make sure your schedule is free before signing up. There is no refund on this once you have signed up (I even put that in bold font (and this too) so you can't say "I didn't know- I didn't see it") but we WILL give you a credit to ANY future workshop we do (its your job to keep tabs on when we next have them and to contact us to use your credit). Again, just check your schedule before you sign up and there will be not problems. This will be fun- we'd love to have you, hang out with you, and build with you! DO COME ARMED WITH QUESTIONS! Our time is yours! Salvage and budget building with the infusion of creativity is our forte too, so there will be a healthy dose of that. Other possibilities: FIELD TRIP to Noah Purefoy Museum- a haven of WEIRD, WEIRD salvage. Tools of the trade- selection, need, and what is "overrated"
If you'd like to be a sponsor for this workshop- in the videos (youtube), on our flyers, in our posts, on our website and more- email the same address above. 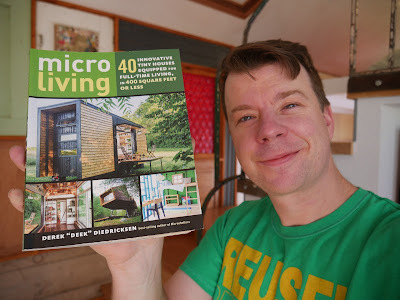 So I've been rather busy- not only with my newest book (now out- "Micro Living"), but with building, travel, and assorted tiny house design (some new cabin plans coming out soon!). 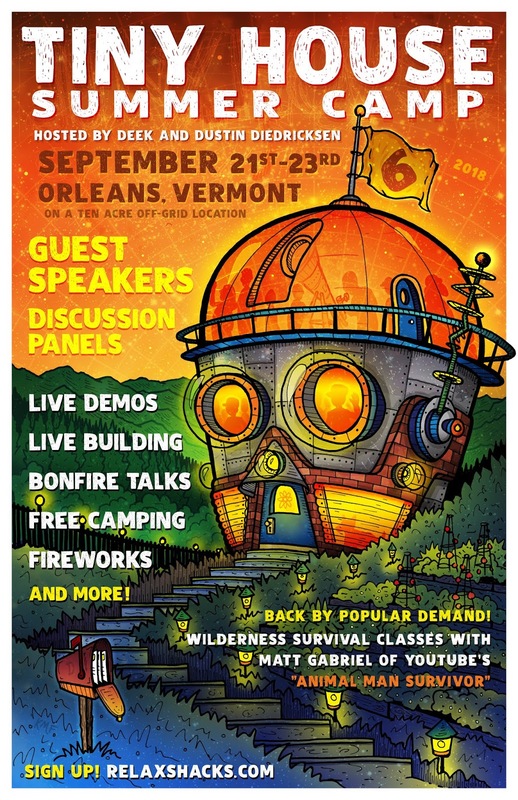 We also have a hands-on workshop (with camping included) in North Carolina coming up as well! (April 5-6-7th in Riegelwood)- Hit the large banner on this site (above) for info! -A guest sleep space for visiting friends here and there. I'm also trying to build it all on a pretty meager budget. A Tiny House Van Conversion for under $5000? Including solar, appliances, decor, and all, this Nashville-based duo (Daniel and Rachel Messick) converted their van into a tiny home on wheels for under $5000! Its true- and here's the full tour! Hope to see some of you at our newly announced Tiny House Summer Camp SOUTH in Riegelwood, NC too! If interested (April 6/7 2019 WITH camping spots included), hit the banner on the main page of this website (up above this post). Tiny House Living On A Budget- Ikea-hacking "ART Furniture"
You've probably seen many of those ultra-affordable tiny tables that Ikea sells for around $8.00 or so, right? Maybe you've even seen them post-use kicking around on the side of the road come trash day. I sure know I have. Well, new or used, they're pretty bland as-is, and Ikea themselves even photographically recommends painting them to up their decor factor. And that is exactly what I did with some leftover paint and a BIG chisel-tip sharpie marker. Tiny Art on A Tiny Budget for Tiny Houses? Here's one just for fun. And lets face it, there are thousands and thousands of worthless baseball cards out there right now. The market on those collapsed decades ago and they're barely worth the paper they were printed on, so why not have fun with them? "Reusing/turning your worthless baseball cards into fun micro art"
I apologize for the shoddy camera quality, but it is what it is (and this was a spur of the moment shoot).... and its merely a simple talk about something I feel pretty strongly about- the whole of issue of whether or not one should convert a shed into a tiny house, or not? Sure, you might INITIALLY save quite a bit of money and time, but are there repercussions? Yes, there are, and there will be. 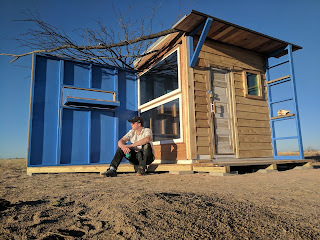 For instance, the fairly standard 2by3 construction of "box store sheds" (to save time, money, and transport weight) isn't something that will convey, nor structurally hold up, if you were to affix (or "plop") an assembly line cheapo shed onto a trailer for your "quick and easy tiny house on wheels". And what about the structural deficiencies of a build with 24" on-center stud work, versus one with residentially-standard 16 on-center framing? There is a BIG different in strength and rigidity. In this video, I explain quite a bit more. If you head over to the real/direct video, be sure to leave your opinions, good or bad- this way we can all peruse what has been left, text-wise, and benefit from it. Thanks in advance for checking it out, and I hope it helps some of you out! 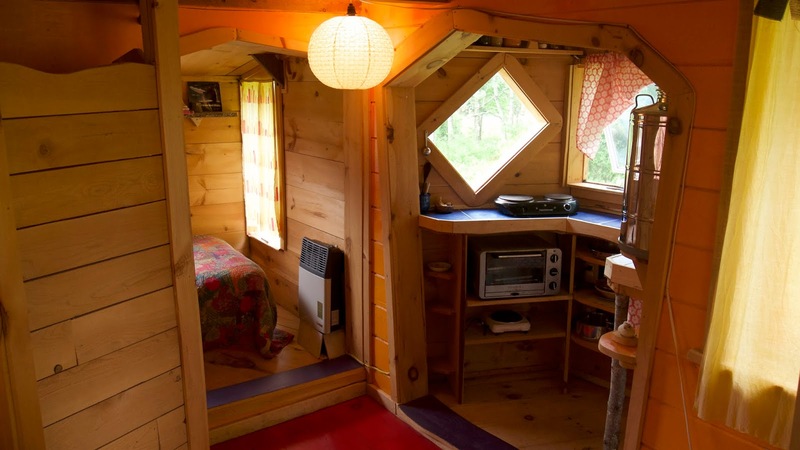 Tiny Houses at this Permaculture "WWOOF" Organic Farm! So I just stayed in this lil' place, located in Thorndike, Maine, and it was just awesome- so much character. And that's JUST the tiny house (which is far nicer on the inside that you'd expect)- never mind the gorgeous farm landscape. If you're into Organic gardening, "WWOOF"ing, or just want to try out a tiny house for a night or two, I highly recommend this place. Its very reasonable too! 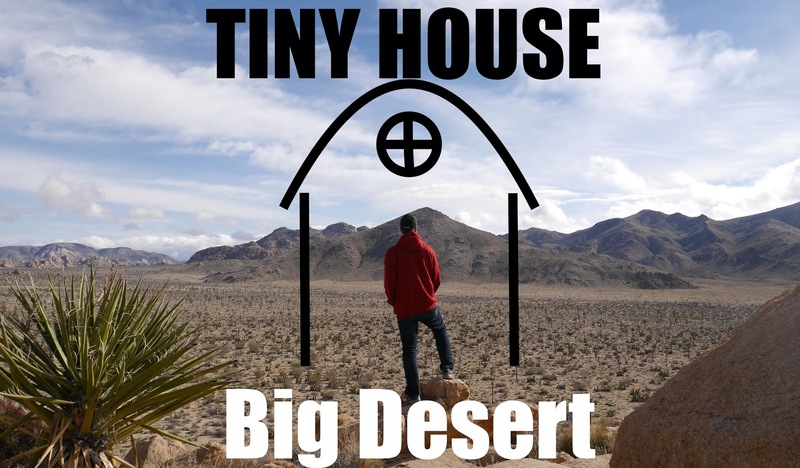 Hey, don't forget too, TINY HOUSE SUMMER CAMP SIX is coming up- Hands-On Tiny House Building with TEN instructors, camping, live demos, bon fire talks, and more! In Orleans, VT! Flyer below- sign up banner is at the top of this page/blog. $9500- Tiny House/Cabin Camp WITH Land in NM for sale! 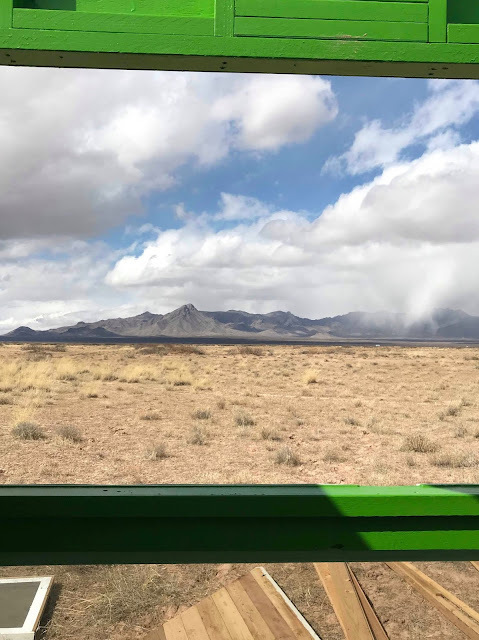 So I really haven't talked about this so much lately, as, well, I've been beyond busy, but I've decided to sell my plot of land near Deming NM -which I've owned for almost 20 years. The plot also has this unique little camp shelter parked on it now....which is included with the land. Above: The top of the front window/glass array flips open for ventilation. Its no mega-ranch in acreage, at a half acre, but there are NO neighbors within sight so you might as well call it 1000 acres. It also has road access and you can drive right up to the plot (even without 4WD), and the views are pretty stunning- especially the stars at night. And if you're into mountain biking, there is endless land and dirt roads galore for you to explore. The cabin looks directly at the "Florida Mountains" range- which has a prominence of almost 4000 feet. Downtown is also only about 25 minutes away (hotels, Walmart, tons of restaurants, a lumber yard, and more). Las Cruces and Silver City- two NM tourist destinations are EXACTLY one hour away. 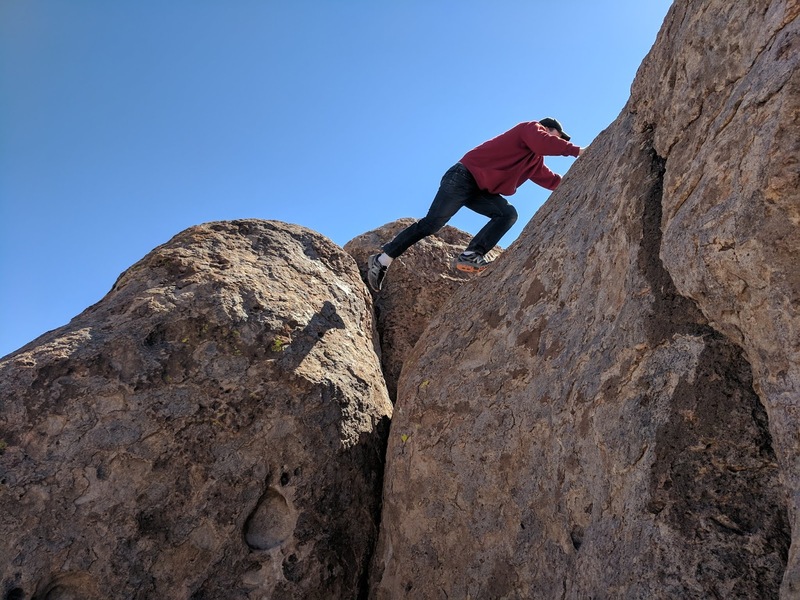 There are also plenty of very cool state parks nearby too (Rock Hound State Park being RIGHT in Deming, for one), and the "City of Rocks" state park (see the photo below of me bouldering there). Photo: (during construction)- showing the front-window's direct view of the mountains- uninterrupted. 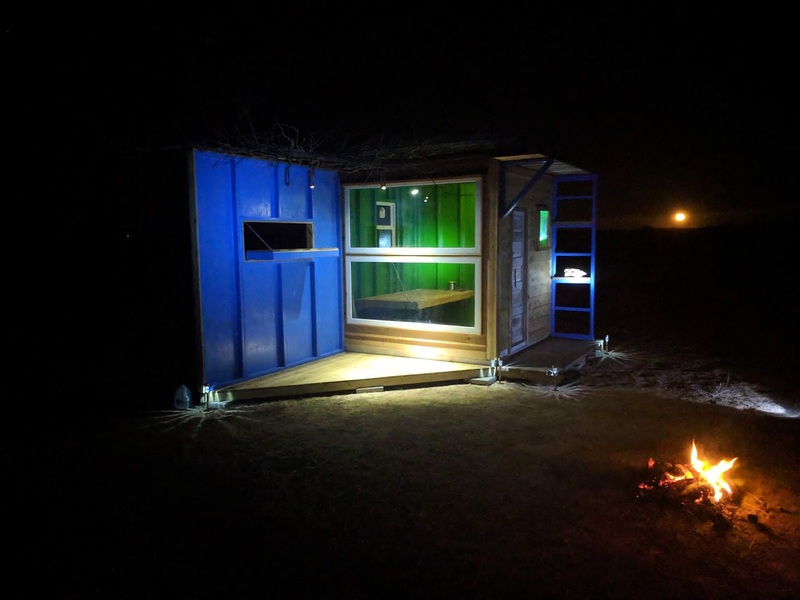 We recently built a prototype glamping cabin that is parked/stored on the land too (see the slew of photos) and that is yours as well should you pick up this lot. Its simple, but funky/fun and well built and has a drop-down bed within (bunks could be added easily instead). In fact, there are two BRAND NEW sleeping bags already hung inside awaiting the next owner. The materials in the cabin were many thousands alone, never mind the labor, so all things said, for a little getaway plot (we've camped there- its pretty awesome/peaceful) its reasonable and ready to go. Above: The original concept sketch. Designed by Deek Diedricksen, drawn by David Stiles. The cabin is on skids/runners too, so moving it could be an option should you want to change its orientation, or move it somewhere else completely. It would be easy to open up the back wall (via a doorway) to add on another room or legitimate bathroom to this camp. As of now we just used a composting camp toilet we'd bring with us. Their work is great, and we've showcased them on my youtube channel in the past (see below). If you might be interested, and have any questions- newenglandrockpress@gmail.com or PM me through my "Derek Diedricksen" facebook account. Just give me a little time to get back to you. Taxes are VERY reasonable/almost nothing ($16 a year)- and they are all paid and current. Buyer is in charge of the closing costs/document prep fees (I'm not even sure what they are for NM, but they're a couple hundred at most, from what I've read).